St. Thomas offers a regular assortment of classes for adults during our Sunday Christian Formation hour, 9:15-10:15am. See our recent announcements for information on current classes. 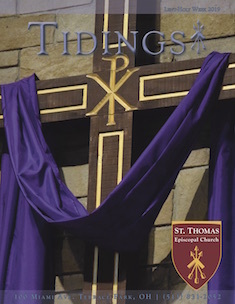 For a complete schedule of offerings, be sure to download the latest issue of our Tidings newsletter by clicking here! St. Thomas Men’s Group is a reading and discussion group. Our starting place for each discussion is a reading from the book we chose to study that week. Frequently, the conversations range far aﬁeld of the week’s reading. There is room for, and we welcome, any guy who is willing to lose some sleep on Monday mornings. The only requirement is to get up early in the morning and join us 7:00-8:00 am, Monday mornings at the National Exemplar restaurant in the Mariemont Inn. The contact person is Bob Henry, (937) 446-2000. Contact Father Darren for a schedule – usually the second Tuesday of the month at 8:30 pm in the Hearth Room.